If you are an action and adventure movies lover then how can you forget the famous movies Captain America the first Avengers? The main character of this movie is Steve Rogers. He has played an important role. The movie consists the story of rejection of Steve for an army officer and later he became an officer and started a war against the enemies. The movie was directed by Joe Johnston and released in 2011. William jackets provide you with the Age of Ultron Captain America Jacket that was worn by Chris Evans who has played the main character of Captain America. The jacket has high-quality material with red, blue and white color combination that will enhance your look. Steve Rogers, a rejected army soldier transforms into Captain America after taking a dose of a "high-quality-soldier serum". But being captain the United States comes at a price as he tries to take down a struggle monger and a terrorist organization. In 1942 America has entered World War 2, and sickly however determined Steve Rogers is pissed off at being rejected another time for an army career. The story of the movie is twisted with the entry of Dr. Erskine. He recruits him for the most important and secret project Rebirth. Proving his great braveness, wits and judgment of right and wrong, Rogers undergo the test and his weak body is unexpectedly greater into the maximum human capacity. When Dr. Erskine is then at once assassinated by way of an agent of Nazi Germany's secret hydra studies branch Rogers is left as a completely unique man who is initially misused as a propaganda mascot; but, when his comrades need him, Rogers goes on a hit adventure that truly makes him Captain America, and his conflict towards Schmidt begins. Overall it’s been the best movie by Hollywood. 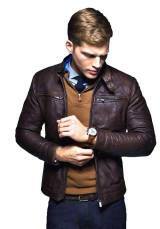 As outerwear specialists, William jackets have a premium selection of Men Jackets. Choose an iconic super dry leather-based jacket, which while blended with being crafted from the best first-rate leather and impeccable tailoring will make sure to face the take a look at of time. On-trend right now is the Captain America Avengers Age of Ultron Jacket. If you want to keep your look classic and chic, shop our best collection of Captain America movies which includes Captain America civil war jacket, Captain America easy rider jacket, Captain America infinity war jacket, Captain America the winter soldier jacket, Captain Marvel Carol Danvers leather jacket, Captain marvel Mar-Vell distressed leather jacket, Civil war winter soldier jacket and infinity war Bucky Bareness jacket. Show your love with Captain America by having this Avengers age of Ultron jacket.